Brancott Estate have proudly supported the Marlborough Falcon Trust since 2010 and to date, has donated over $500,000. These funds have contributed to the construction of our rehabilitation and breeding aviary and provided for the ongoing care and well-being of the falcons. 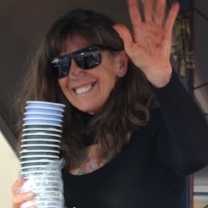 Try Dana's very special 'falcon' blend at the Nelson Markets every Saturday and Sunday morning. Incredibly Dana donates 5c for every cup sold, challengeing her customers to match it. A small business contributing in a BIG way. Thanks Dana and thank you Dana's clientele - you are our Hero's! Our local clubs of Lions Club International are pivotal in the maintenance of our grounds, buildings and aviaries. These wonderful people provide valuable skills to an exceptional standard for which we are most grateful for. These talented people gifted us with all the materials, printing and construction of the signs at our Falcon Valley Walkway at Brancott Estate Heritage Centre. Their professional and artistic signs can been seen all across the Marlborough region and we sure are pleased they love falcons as much as we do! Be it designing a simple logo or a full corporate identity, a simple web site or an extensive media based solution, SKD have the expertise and experience to fulfil any brief. SKD supply web services, support and advice to the MFT on an ongoing basis. From humble beginnings in 1996, BP Computers serves the Marlborough and Kaikoura region in all things IT related. The MFT consider BP Computers to be one of our heros as they have helped us every step of the way. From gifting a fully reconditioned laptop (which is put to very good use), to ongoing support with free advice, servicing and antivirus software. Another example of a great local business helping others. We can highly recommend BP Computers if you have any IT issues.